Paracheirodon Innesi common name neon tetra. They can grow up to 2.2 cm / 0.85 inches. They are best kept in water parameters of Ph range 5.5 – 7.5, and temperatures of 20-26 °C / 68-80 °F. 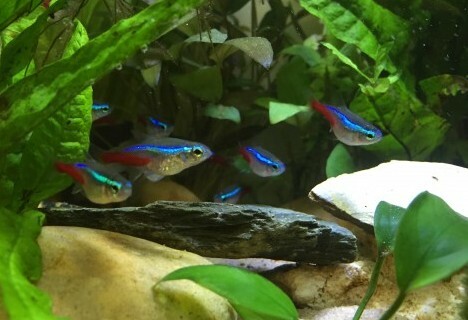 The Neon Tetra is an extremely popular aquarium fish, with its lovely bright blue and red colours, they make a lovely addition to any tropical aquarium. The neon tetra fish is a hardy fish, and is often one of the first fish species purchased by beginners. They are extremely peaceful and are better in small or large groups, they mix well with smaller peaceful community fish. 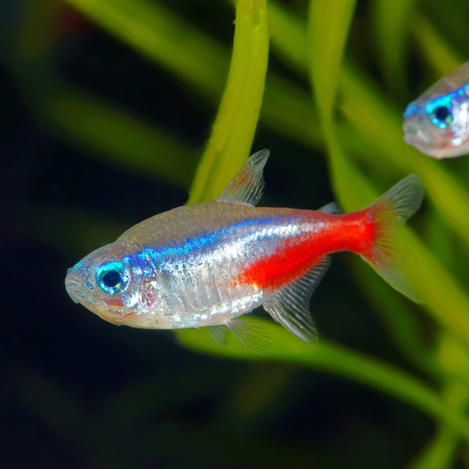 Neon tetra are not fussy eaters and will accept most food, including flake, small pellets, and mini granular foods, with treats of freeze dried, live or frozen foods. Flake, small pellets, mini granular foods, also a treat of freeze dried, frozen and live foods. With neon tetra we only recommend feeding once a day at the most.